A free envelope template is a great alternative to going out and buying envelopes. They can be perfect for , , , and everything in between. It's actually pretty easy to make your own envelopes and once you've made a few, you can whip up a pile pretty quickly. You'll find all the popular sizes of envelope templates below including announcement sized envelopes A2, A6, A7, A8, A9, A10 which are most commonly used for cards of any type. There are also some free envelope templates for #10 envelope. 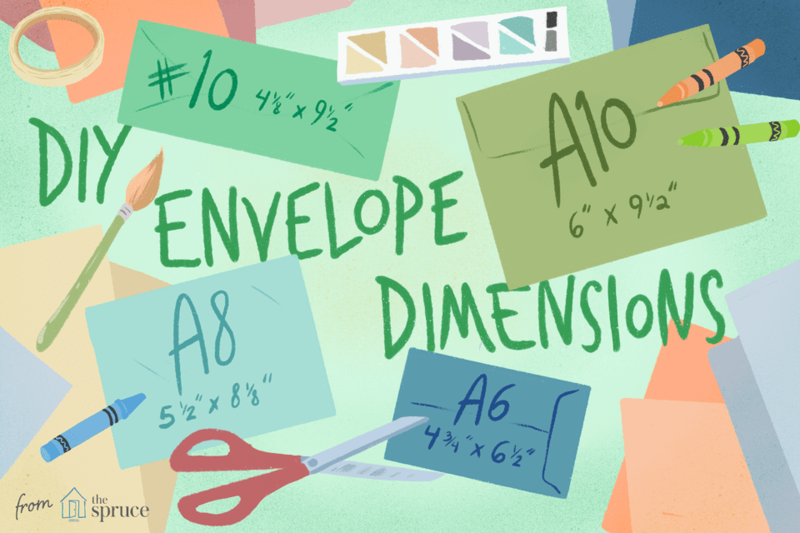 To create your envelopes you'll need a printer, glue or tape, and paper. To make standard white envelopes, use white printer paper. You can also use white cardstock for a more sturdy envelope appropriate for a greeting card. Scrapbook papers and patterned or colored cardstock can also be used to create a unique look. Tip: Be sure to follow the printing directions for each template so you get the correct size. I always like to double-check the size after I've printed it out. You can do this by taking a ruler and making sure that the measurements are what they are supposed to be. Before you print out your envelope you'll need to determine what size you need for what you want to mail. There are standard envelope sizes but sometimes cards will come in irregular shapes and you'll need to figure out the best size of an envelope for it. Measure your envelope and then take a look at the table below. It includes the size of the envelope as well as the maximum size of enclosure that will fit inside of it. A2 4 3/8" X 5 3/4" 4 1/4" X 5 1/2"
A6 4 3/4" X 6 1/2" 4 5/8" X 6 1/4"
A7 5 1/4" X 7 1/4" 5" X 7"
A8 5 1/2" X 8 1/8" 5 1/4" X 7 3/4"
A9 5 3/4" X 8 3/4" 5 1/2" X 8 1/2"
A10 6" X 9 1/2" 5 3/4" X 9 1/4"
#10 4 1/8" X 9 1/2" 3 7/8" X 9 1/4"
When in doubt, go with a bigger size or create a custom envelope with a single sheet of paper that you can trim down to size before folding. A2 is probably the most common envelope size for cards. If you make your own cards, this is a great envelope size because it will fit 4 cards or 2 folded cards that have been cut from an 8 1/2" X 11" piece of paper. Mel Stampz has free for both side opening and top opening envelopes. You can print them with or without the score lines. Jam Paper also has a that with one click can be downloaded in your favorite word processor. It already has addresses in the correct places to help get you started. The A6 envelope is another commonly used size that's most often used for wedding and party invitations. There's an at Neenah Paper. Here's another A6 envelope template that even has instructions for cutting and assembling the envelope. A7 envelopes hold a card that is 5" X 7" which can include invitations for weddings, , or any other event. There are also greeting cards, such as , that will sometimes fit in an A7 envelope. Artsy Bride has an that includes photos of how the envelope is put together and The Paper Mill Store has a that includes instructions as well. You can also use an A8 envelope to hold greeting cards. A greeting card that is 5 1/4" X 7 3/4" is perfect inside an A8 envelope. You can download this free from Karr Graphics. A9 envelopes are often used for homemade cards because one folded card or two flat cards made from a piece of cardstock turns out to be 5 1/2" X 8 1/2", making it a perfect fit for this envelope. Karr Graphics has an you can print, cut out, and assemble. An A10 envelope holds an enclosure that is 5 3/4" X 9 1/4". This is a big envelope for a large card or invitation but small enough that no extra postage is required. Here's a free from Karr Graphics. #10 envelopes are conveniently sized for holding a piece of letter paper that is folded into thirds. This envelope is used everywhere from mass mailings to everyday correspondence. Here's a free #10 envelope template from . There's that even shows you where the mailing address and return address goes. If you've made your own envelopes using a template or you have purchased envelopes you may decide that you'd like to print directly on them before mailing them out. This is actually easier than it sounds. Here's a guide on how to do that in as well as .